Since I was 16 I have made a point of taking care of my appearance. A touch of powder and mascara, a face mask once a week. As I got older this evolved in to a skincare regime and taking the time to apply a full face of make up. When I was pregnant I would often be told I wouldn’t have time for any of that once the baby comes. I’d be too busy with the baby to have time or too sleepy to care how I looked. I took this on board and was prepared for giving up all things beyond basic skincare. As it turns out I needn’t have worried. Sure my time for self care and beauty routine is a lot more restricted than before, but that just means I have to make the most of it. This doesn’t take long at all. My daughter and I brush our teeth together and then I let her play or watch some cartoons while I get washed. Currently I’m using the Lancome Pearly Cleanser*, perfect if you were too tired the night before to remove your makeup properly. You only need a small amount of product and it give your skin a thorough clean without leaving it feeling stripped (but don’t use too much or skin will feel dry and tight). Toner, serum and lotions only take moments to apply and massage into the skin. If your little one finds it fascinating find a way to include them. Luna has her own little tube of moisturiser and I put a little bit on her cheeks after I’ve done mine. I still manage to fit in face masks regularly. I often do a moisturising mask like Kiehls Ultra Facial Overnight Hydrating Mask* in the morning. I slap it on when I wake up and let sit while I get Luna up and we have breakfast. Things like mud masks aren’t a problem either, she just giggles and I try not to get too close so she doesn’t touch it. Getting your face on can be a challenge when you’re tight on time and you have little fingers trying to get in to everything. You want as much impact with as few products as possible and sometimes the tools you use can make thing easier too. If I have time for eye shadow I do it first. Try to pick a palette that has everything you need in it. This way your little one can’t make off with a few of the shades or get one open while you aren’t looking. With some practice you’ll be creating some awesome looks in minutes with 2-3 brushes. Be careful with the open mascara tube, Luna once stuck her finger in mine and that was not fun to clean off. If you don’t need primer, skip it. Most foundations work well enough without them. 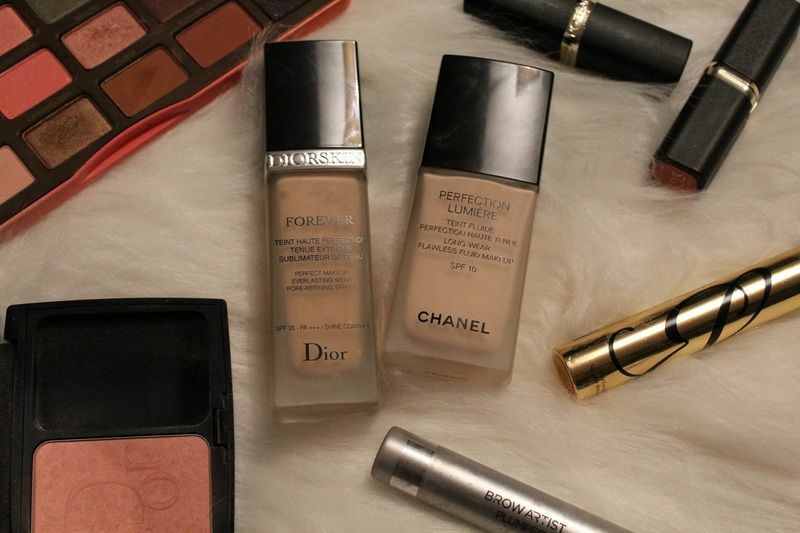 As far as foundations go I would recommend a long wear full coverage foundation; if you can use on that dries to a powder finish, even better. This way you can get away with a little concealer as possible and you won’t have to touch up much during the day. 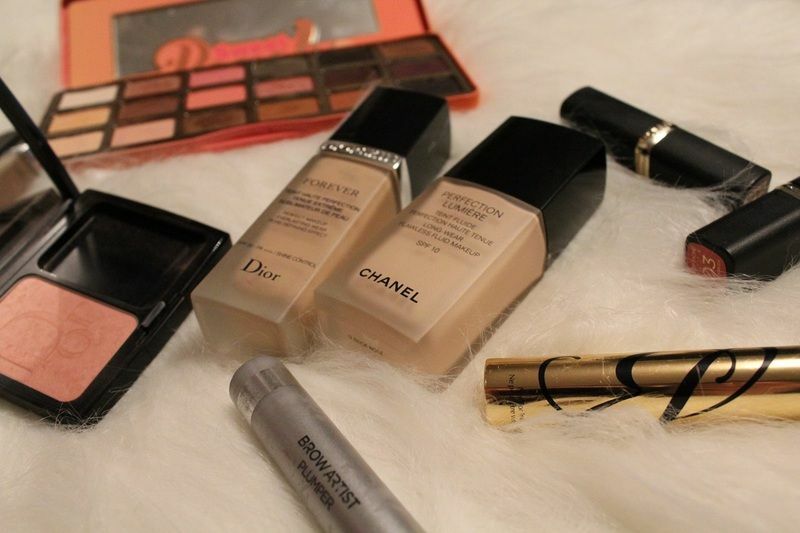 My favourites are Dior Skin Forever* and Chanel Perfection Lumiere* (a bit pricey, but worth every penny). I’ve also ditched makeup sponges on busy mornings. You have to remember to dampen them and if you only have a couple it can be a pain to find time to wash them regularly. I use the Morphe 457 brush which blends out foundation in no time, or sometime I’ll throw it on with my fingers on days when time is tight. When it come to blush, bronzer and highlight; it depends on time again. Sometimes I just throw on some bronzer or blush and when I can I do all three. I always keep handy the products I know will work and are fool proof for me. So even if I go too hard on the blush I’m not going to look like a clown just a little flushed (it wears down during the day so this doesn’t bother me). If I only have time for a few basics I definitely focus on my brows. When my brows are groomed I always look more put together even if I don’t have anything else on my face. For a quick tidy I use the L’oreal Brow Plumper*. As with everything to do with parenthood, it’s different for everyone and nothing is set in stone. Don’t ever let anyone make you feel guilty for taking a bit of pride in your appearance; it’s important that we find time to do little things like this, give our self esteem a daily boost. Links marked with and asterisk (*) are affiliate links.